University of Washington engineers have developed a novel technology that uses a Wi-Fi router -- a source of ubiquitous but untapped energy in indoor environments -- to power devices. The Power Over Wi-Fi (PoWiFi) system is one of the most innovative and game-changing technologies of the year, according to Popular Science, which included it in the magazine’s annual “Best of What’s New 2015” awards announced Nov. 18. NASA recently tested components for an engine that could be used for Mars landers powered with methane, a fuel that has never before propelled a NASA spacecraft. More stable than liquid hydrogen, today’s most common rocket fuel, methane can be stored at more manageable temperatures and recovered or created from local resources. A team of Florida State University materials researchers has developed a new type of blazingly bright light-emitting diode (LED) using an organic-inorganic hybrid that could lead to cheaper, brighter, and mass-produced lights and displays in the future. Textron Aviation, the world’s largest maker of business propeller planes like Beechcraft Bonanza, Baron, and King Air, said Nov. 16 it would use a brand new advanced turboprop engine developed by GE to power its latest single-engine turboprop plane. The engine burns 20 percent less fuel and produces 10 percent more power, compared to engines in its class. 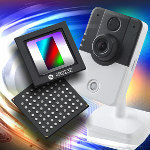 The MatrixCam video development kit (VDK) from ON Semiconductor has been developed specifically to encourage greater video adoption within Internet of Things (IoT) products, as well as accelerating time to market for OEMs. Among its key applications are home automation systems, building access devices, baby monitors, advanced lighting controls, and smart appliances. It offers smart streaming capability and numerous interconnectivity options, including Wi-Fi, Ethernet, and Bluetooth Low Energy (BLE). It can connect to cloud services such as Amazon Web Services and Google Cloud Platform, with support for both video-on-demand and live streaming. In certain applications, such a fishing reels, wave springs are an excellent alternative to coil springs. Wave springs have the ability to take up 50% less axial space than conventional coil springs, but they still provide the same force and deflection required for the application. Self-lubricating iglide bar stock enables free design of maintenance-free sliding elements and bearings. A range of iglide material options allows for the best friction and wear values with a specific application’s requirements to be created. 19 iglide materials are available as bar stock, with a variety of plate and tube options available as well. Custom machining solutions are also available in as little as 3 days. MTS Sensors has made enhancements to its R-Series of high-performance magnetostrictive sensors for absolute position measurement. 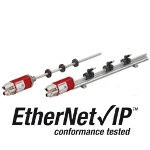 The series now conforms with the latest version of the EtherNet/IP communication protocol with device-level ring (DLR) compatibility, having recently recertified against the ODVA EtherNet/IP Composite Conformance Test revision CT12. Through this, interfacing with a wider array of EtherNet/IP-compliant hardware across numerous industry sectors has been made possible, such as factory automation systems, plastic injection molding apparatus, and materials handling equipment. New Scale Technologies has created a new beam steering developer’s kit for precise point-to-point beam positioning and dynamic scanning up to 100 Hz. 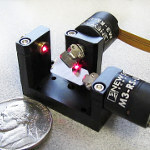 The two piezoelectric rotary stages in the DK-M3-RS-U-2M-20-L developer’s kit have a familiar galvo-scanner form factor but are only 12 mm in diameter. A closed-loop controller is embedded in each tiny stage, making the complete system more than 25 times smaller than traditional systems with external controllers. Each smart stage rotates a pre-mounted aluminum-coated mirror +/- 20 deg at up to 1,100 deg/sec with angular resolution of 0.05 degrees (1 mrad). Applications include medical lasers and imaging systems, industrial measurement and spectroscopy instruments, and laser printing and engraving. The new BSHP runner blocks from Rexroth distinguish themselves from the previous generation by reducing pulsation when placed under a load. The machining quality and accuracy of cutting machine tools, measuring machines, glass machining equipment, and other tooling benefit as a result. Rexroth has also boosted dynamic load capacities by approximately 26 percent, with static load capacities improving by as much as 50 percent. Higher dynamic values lead to a service life that is up to 200 percent longer. These units also promote energy-efficient lightweight construction for new machine concepts. Material Wars: Who's going to win the automotive metals race? There’s a lot of press out there about new materials replacing sheet steel in the automotive industry. Aluminum and composites are being touted as the next best things for taking weight out of cars, but steel companies are not ignoring this lightweighting trend. By David Paratore, President and Chief Executive Officer, NanoSteel. A piezoelectric load-sensing washer being developed by a professor and a recent graduate at the University of Alabama in Huntsville provides a more accurate way to measure the clamping force exerted by the bolt it is on. That’s a benefit for numerous industries where the clamping force of bolts is critical, including construction, auto assembly, nuclear power, racing, aviation, and space. 3D-printing and additive manufacturing solutions heavyweight Stratasys has teamed with Aurora Flight Sciences to deliver what is believed to be the largest, fastest, and most complex 3D-printed unmanned aerial vehicle (UAV) ever produced. The high-speed aircraft was built using lightweight Stratasys materials to achieve speeds in excess of 150 mph. Combining the open and engaging feel of a motorcycle with the dynamic handling of an automobile, the Honda Project 2&4 made its North American debut Nov. 17 at the 2015 Los Angeles Auto Show. The design is the winner of the company’s in-house 2015 Honda Global Design Project. The Honda Project 2&4 is powered by the RC213V competition motorcycle engine, a 999 cc V-4 unit, originally developed for the world-class MotoGP motorcycle racing series and specially tuned for use on public roads. With a 14,000-rpm red line, the powerplant is mated to a six-speed dual-clutch transmission and delivers peak power of 212 hp at 13,000 rpm, and peak torque of 87 lb-ft. at 10,500 rpm. The body design and engine position were inspired by the legendary Honda RA272 Formula One racecar of 1965. Two years in the making, the BionicKangaroo from automation technology specialist Festo demonstrates how pneumatic and electric drive technology can be combined with a new control technique to make a highly dynamic system. The robo 'roo demonstrates how the real-world kangaroo recovers and stores energy, and retrieves it on the next jump. The function of the natural Achilles tendon is carried out with the help of an elastic band made of rubber. 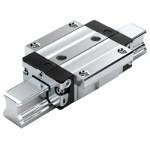 It is fastened at the back of the foot and parallel to a pneumatic cylinder on the knee joint. The artificial tendon cushions the jump, simultaneously absorbs the kinetic energy, and releases it for the next jump. The unit achieves its high jumping power with the aid of pneumatics. In the places where the highest positioning accuracy is called for, electric motors are used -- for example, when it comes to controlling the tail and hip.